Home » Lifestyle » Children’s First Dental Visit: When do kids start going to the dentist? Children’s First Dental Visit: When do kids start going to the dentist? As a parent, its easy to know when your well baby visits are, your vaccines are due, and and to go to the Dr when you are sick, but when it comes to providing dental care, many parents let tiny teeth fall by the wayside. Pediatric dental care is insanely important, with about 33% of kids under 8 getting decay. Oral health is good health, from a confidence and self esteem stand point just as much as medical, and I wanted to share some important information in regards to taking the best steps to starting your child on a lifetime of dental care. When it comes to my own kids, oral hygiene has always been important. I do not have great teeth myself and have had constant struggles as an adult, so make sure their teeth are healthy and strong is a priority. Because my kids would probably never brush if I didn’t remind them, I have to make sure that they have all the tools that make brushing fun and easy. Second, I make sure they are taken to a kids dentist on time, every time. Thankfully my daughter has had super healthy teeth from the time she was born and we are in a stage of straightening them now. My son, 6, had perfect dentist visits until the beginning of last year when we went from flawless teeth to 5 cavities in between regular appointments. It was devastating! He had to be sedated and get a silver tooth and I felt terrible about the entire thing. Turns out he may have been drinking a bit too much Gatorade and not brushing and it just really took some havoc out on his teeth. Now, in addition to his cleaning and regular appointments, we cut way back on sugary drinks and he has been cavity free since. Continue reading to find out some valuable information on the right way to stay decay free! Maintaining proper oral health matters more than just keeping a sparkling smile – it’s also important for good overall health. That is especially true for children, as decay in baby teeth can lead to speech problems, oral infections and damaged adult teeth, according to the Centers for Disease Control and Prevention (CDC). Tooth decay is largely preventable, yet it ranks as the most common chronic disease among children. About 33 percent of young kids (ages 2 to 8) have cavities in their baby teeth, and 20 percent of kids in the same age group have cavities in their adult teeth, according to the CDC. Find out how your state ranks in managing children’s oral health based on various key measures, including optimally fluoridated water and availability of school-based dental programs, by clicking onto the Pew Center on the States report. February is National Children’s Dental Health Month, a reminder that proper dental health habits should start early for young people nationwide. Yet some people are unaware of recommended dental guidelines for children. A recent UnitedHealthcare survey found that just 31 percent of Americans correctly recognized that most medical professionals recommend children should visit the dentist for the first time by age one; 40 percent said the appropriate age was between two and three years old; and 27 percent said four years or older. Never put a baby to bed with a bottle of milk, formula, fruit juice or sweetened liquid. When these liquids pool in a baby’s mouth, they form a sugary film on the baby’s teeth, leading to decay and infection. Starting at birth, clean the baby’s gums with water and a soft cloth or child-sized tooth brush. Once a child reaches age 2, parents can start brushing a baby’s teeth with a soft bristled toothbrush and a smear-sized dab of fluoride toothpaste (no larger than a grain of rice), making sure to teach the toddler to spit out the toothpaste. Schedule the baby’s first dental visit when the first tooth comes in, usually between the child’s first six to 12 months. Help your child brush twice a day with a small amount of fluoride toothpaste; for children ages 3 to 6, this means a pea-sized dab. Make sure your child does not swallow toothpaste, which may expose them to too much fluoride. Begin flossing when back teeth begin to come in. Toothbrush bristles cannot reach between teeth, leaving those teeth vulnerable to bacteria and decay. Limit sugary snacks and drinks between meals. When sugar comes in contact with teeth, decay-causing bacteria can produce acids that damage your child’s teeth. Encourage children to eat healthy snacks, such as fruits and vegetables. Take your child to the dentist regularly and ask about fluoride supplements, which make the tooth enamel strong and help protect it from decay. For most children, that means visiting the dentist twice a year. Sealants are plastic coatings placed on back teeth to protect them from decay, and they are sometimes covered as a preventive service by dental plans. Ask the dentist about placing sealants for your child once he/she turns 6, when molars first come in. Be sure to take advantage of your health plan’s preventive dental benefit if available and visit your dentist regularly. 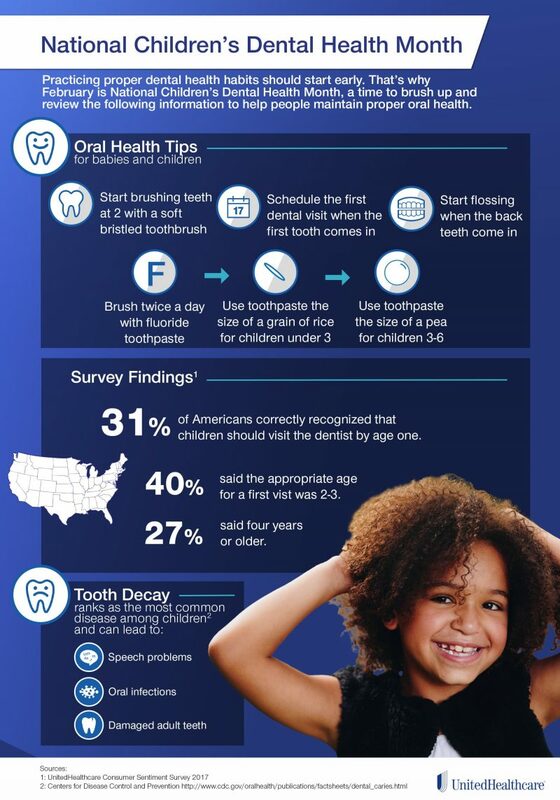 By taking these steps, you can start your children down the road of good oral health.